The Kanien’kehá:ka (Mohawk people) are the Keepers of the Eastern Door of the Haudenosaunee – The People of the Longhouse. Settlers call them the Iroquois. The six nations of the Haudenosaunee Confederacy are the Kanien’kehá:ka (Mohawk), Oneniote’á:ka (Oneida), Ononta’kehá:ka (Onondaga), Kahoniokwenhá:ka (Cayuga), Tsonontowane’á:ka (Seneca), and Thatihskarò:roks (Tuscarora). One will notice that there is no Tsi tekaristì:seron (Where the tracks are dragged) – or borders – on this map. Haudenosaunee land spans the border between so-called Canada and the so-called United States, and did so before the tracks were dragged by colonists. 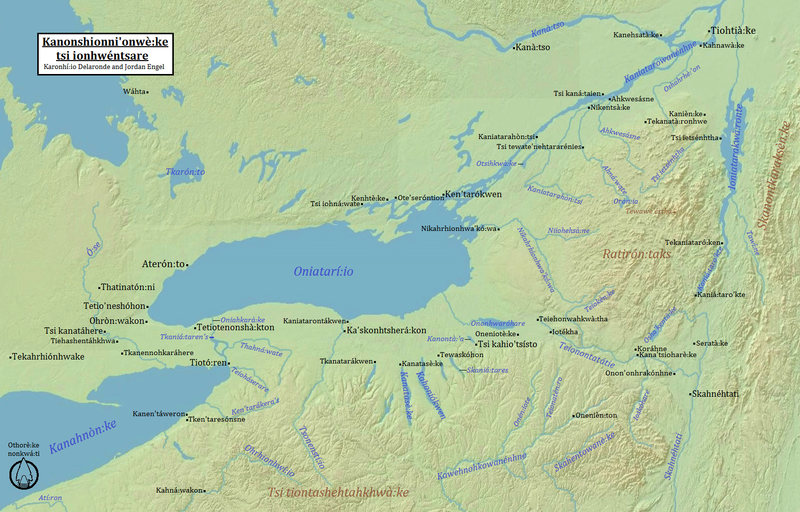 This map of the Haudenosaunee homelands was made by Karonhí:io Delaronde, a Kanien’kéha speaker from Kanièn:ke (Ganienkeh – http://ganienkeh.net/), and Jordan Engel, a map-maker from Ka’skonhtsherá:kon (Rochester). It is best viewed in it’s full size by clicking on the image above. I climbed what settlers have names St. Regis Mountain today but cannot find a record of its Mohawk or Haudenosaunee name. I would love to know if it carries a name bestowed by the indigenous tribes. Thank you! I am from GLENS FALLS and Andia’Ta’Roc’Te ……. SPAC was a place We have in common I’ll bet ? Reblogged this on Liwen ñi Mapu & Asoc. Colectivo Red de Noticias e Información sobre Pueblos Indígenas y Derechos Humanos. could you please include our community kanatsiohareke in the map?